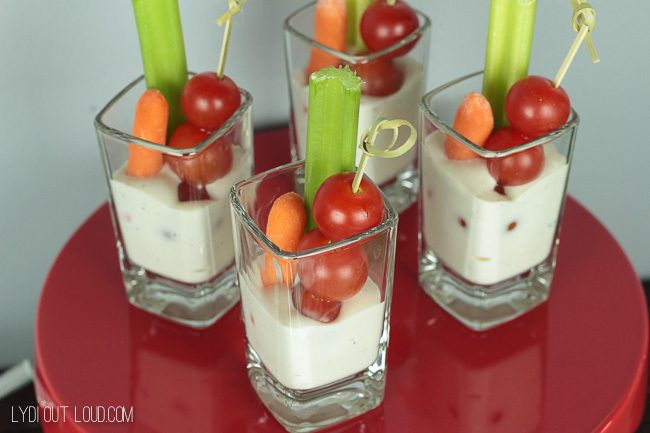 When planning my Super Bowl party, of course it’s all about the food. Parties and food go together like, well, you get where I’m going right? 😉 In order to keep any one room of the house from getting too crowded (because you KNOW that everyone likes to congregate where the food is! 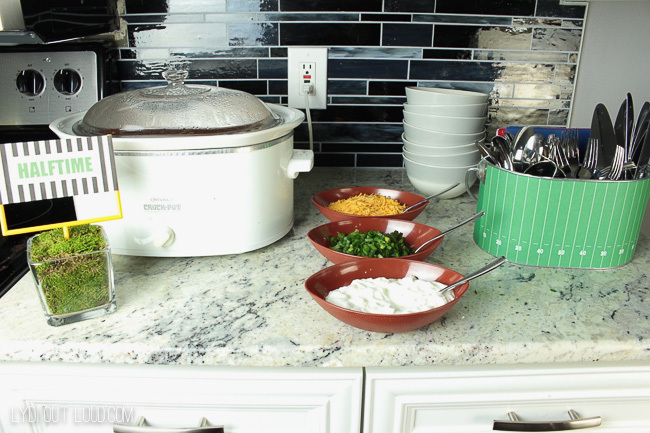 ), I spread out my food stations among various areas. So let’s get down to it! 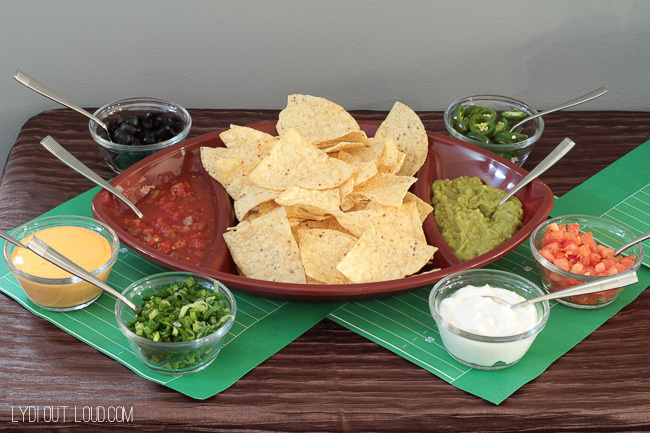 Nacho Bar with salsa, guacamole, nacho cheese, sour cream, black olives, diced tomatoes, jalepenos and green onion. 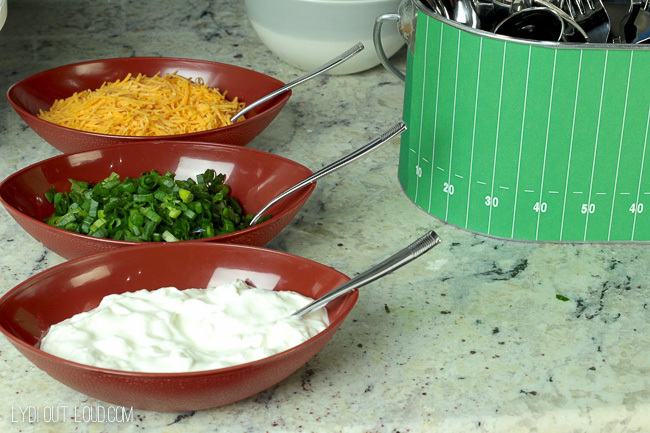 Halftime is the perfect time to warm up with a bowl of delicious Chili served with shredded cheddar cheese, green onions and sour cream. 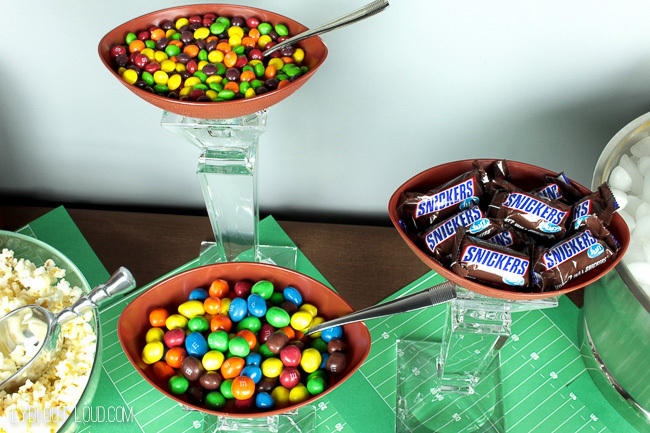 Here we have Snickers Brownie Footballs, Skittles Sparkling Flavored Water and a football shaped fruit pizza. 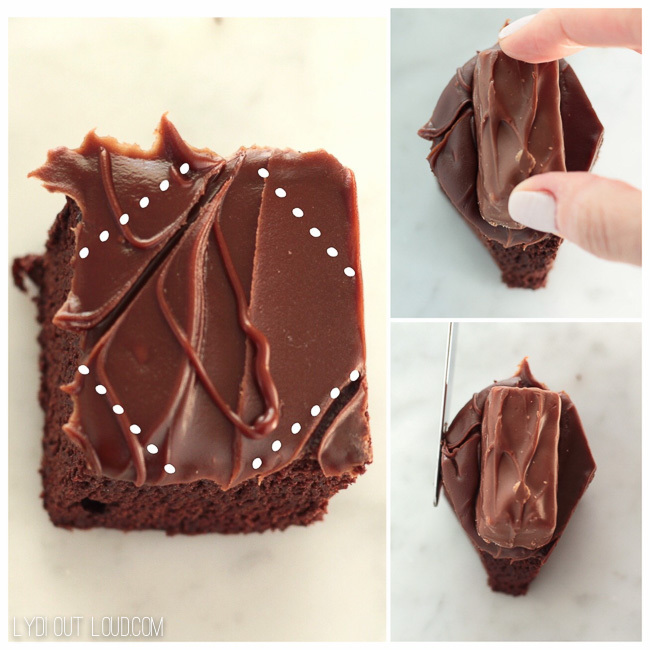 Cut the corners of square or rectangular shaped brownies (shown with dotted lines below). 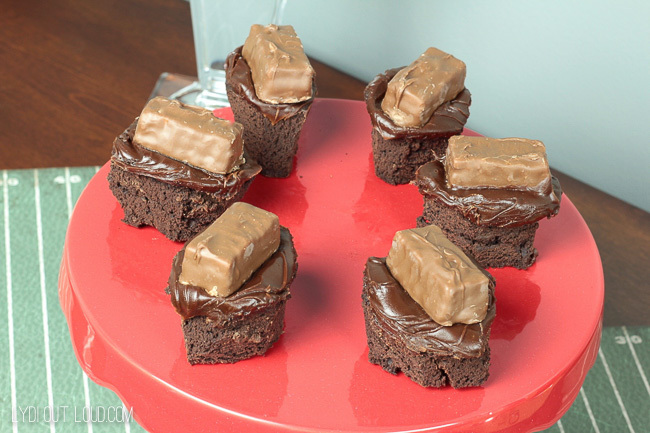 Press Snickers Fun Size candy bars into the top of each brownie. 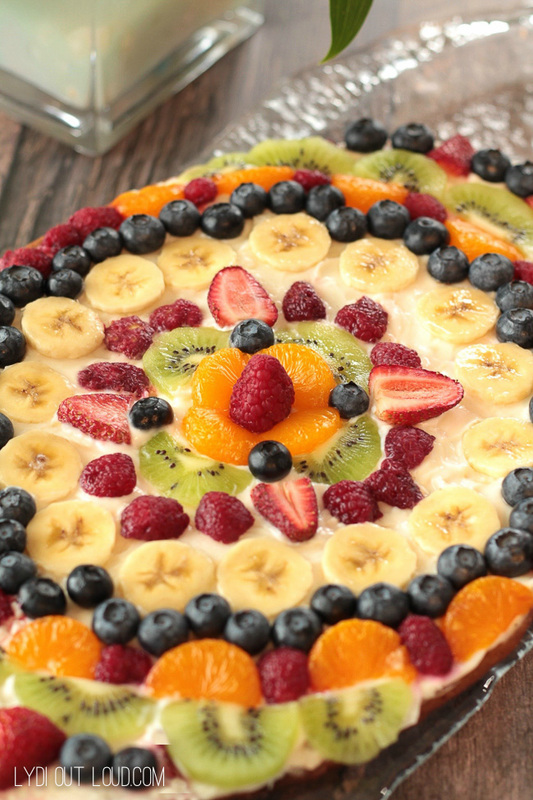 Smooth the hard edges of frosting with a knife to get the oval shape. Separate Skittles candy by color. 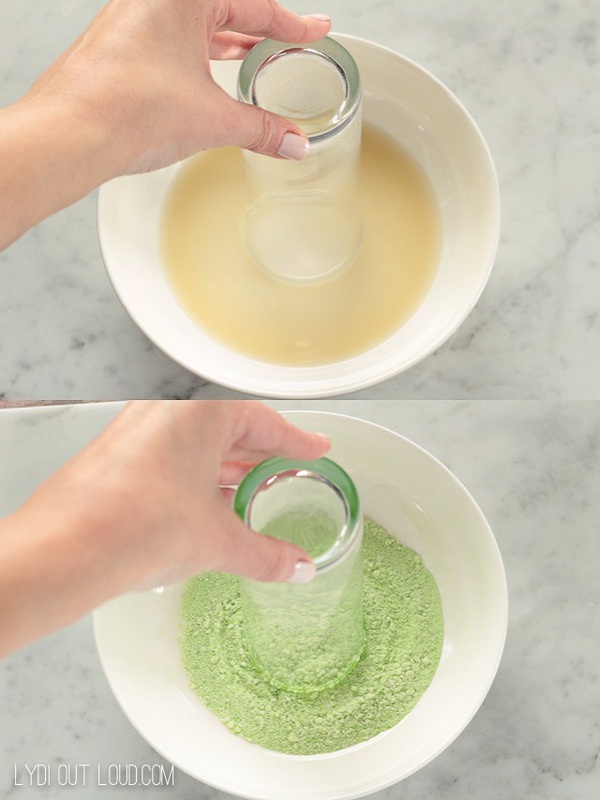 Blend candy in shifts by color in a blender or food processor until they are broken down to small crystals. Dip into skittles until rim is covered with the candy. 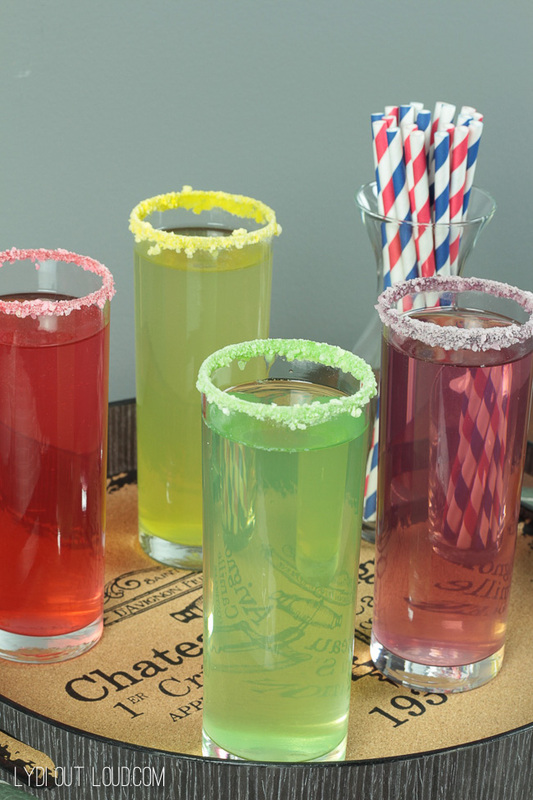 Add sparkling water to glasses and flavor with corresponding colors water flavor drops. I did lemon, grape, fruit punch and I mixed lemonade and blueberry to achieve the green color (yellow and blue make green). Not everyone will be into the game, so we have some other ways to have fun too. I set up a football backdrop and an iPad so that guests can have fun in the photo booth or take selfies if they get bored with the game. 🙂 I had plenty of props on a nearby table (pop pom’s, face stickers, whistles, etc.) 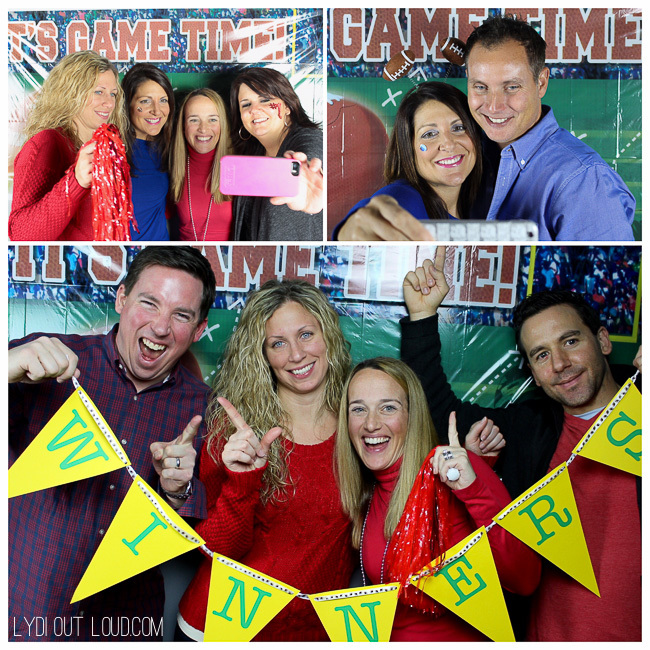 Every guest picks a team when they arrive and the guests who picked the winning team get to pose in the photo booth at the end of the game and post pictures on social media using #winners! Who doesn’t love a good game of BINGO?! 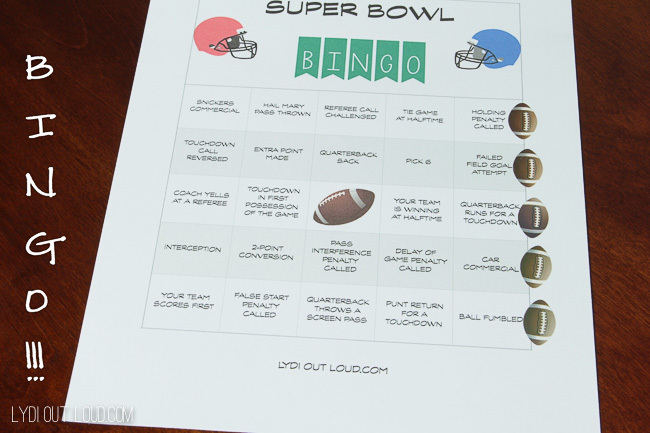 This fun Super Bowl Party version serves as entertainment and even a little bit of a lesson on the sport! Use these printable versions available below (5 different boards) or the blank board to fill in your own squares! Football stickers are a fun way to mark the squares. 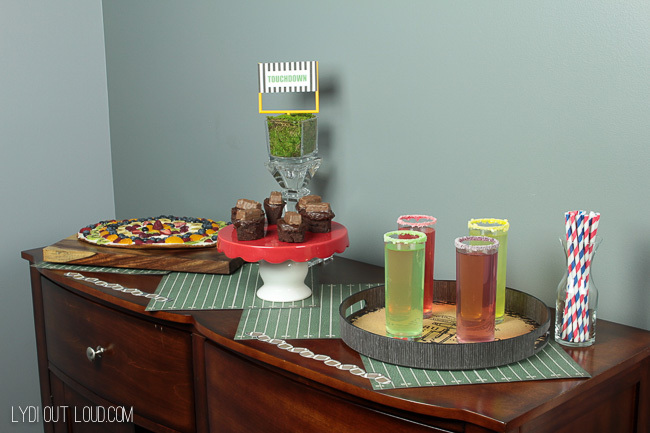 I love a good football themed party because there are so many fun decorations you can make/use! 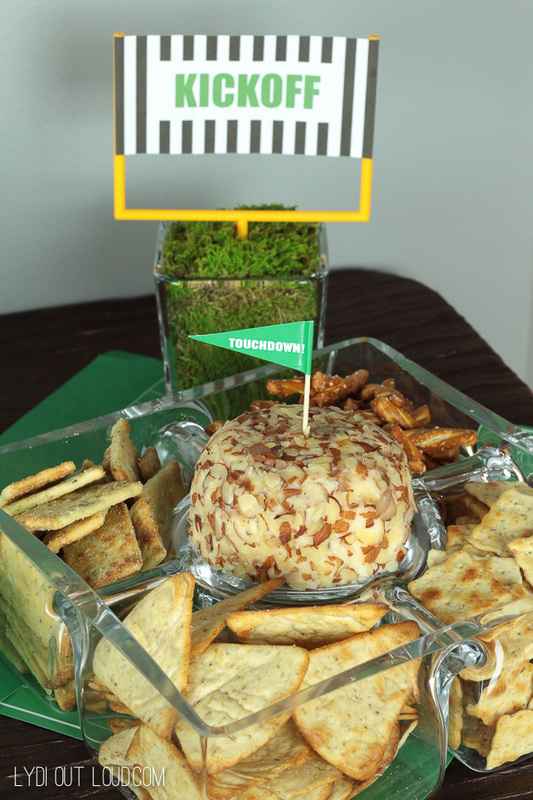 I used brown table runners with football themed scrapbook paper on top to place all of the food on at each station. I had a couple of football banners to display at various areas in the house as well. 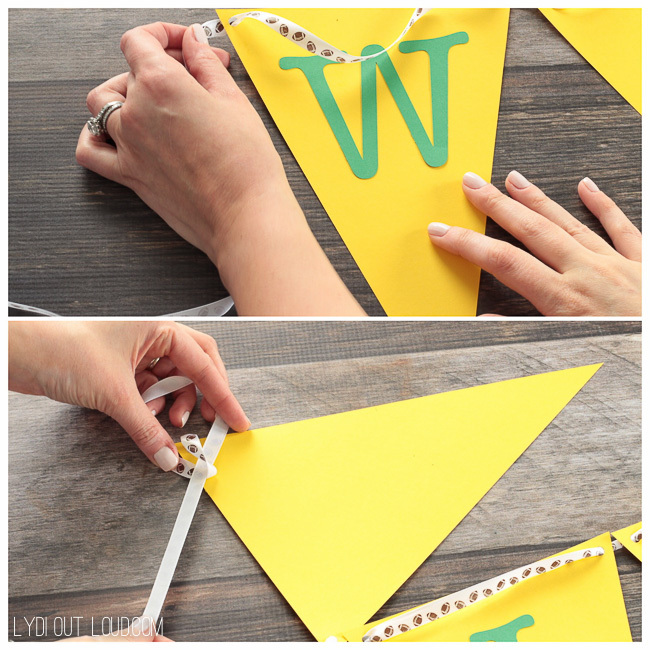 These are the decorations I made and directions so you can make your own! 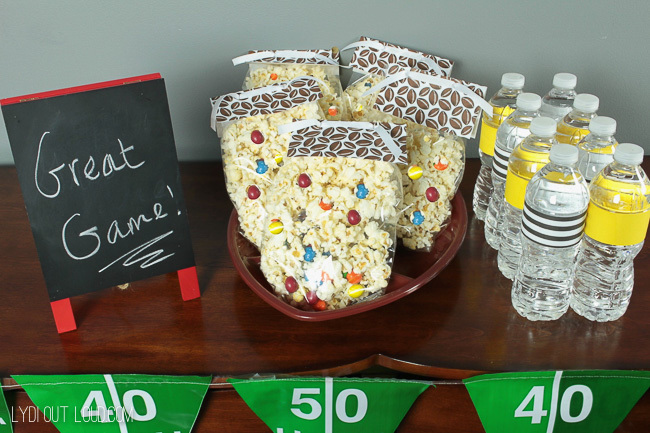 You may have noticed the goal post signs at each food table; we named each food station with a football term and I made these signs to correspond. 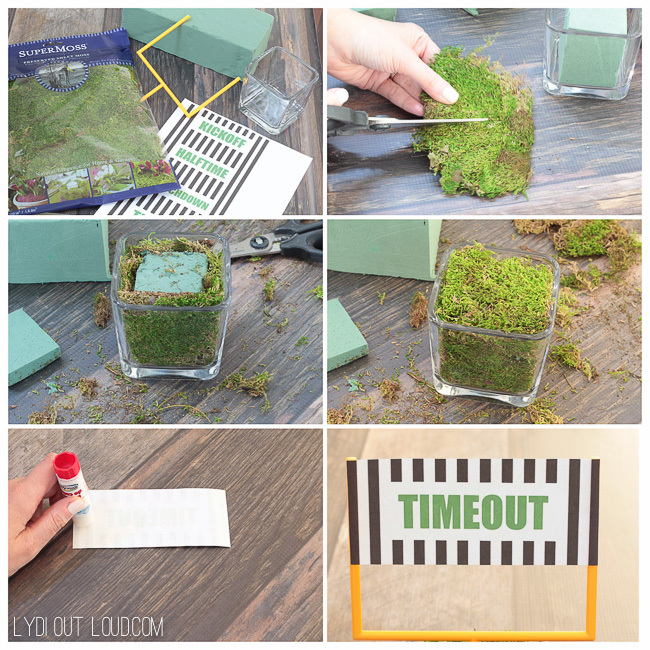 Cut floral foam to fit inside of vase with a gap between the foam and vase to allow room for moss. Cut 5 sheets of moss to fit on each side and on top of the floral foam. Print and cut the signs to fit the goal post. Using a glue stick, adhere the sign to the goal post. Insert goal post into vase. This was a fun decoration that later served as a photo booth prop! 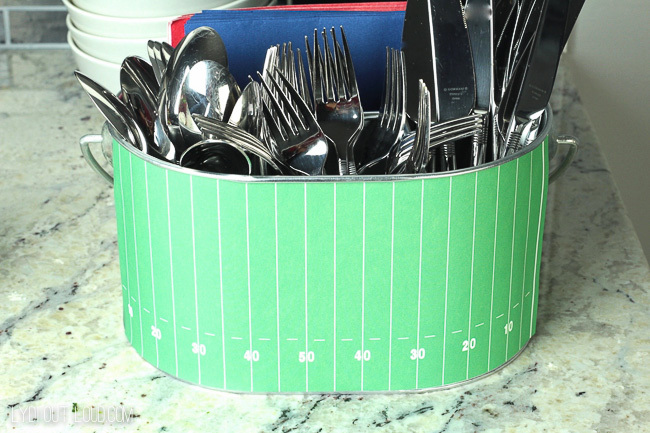 I’ve had this metal silverware caddy for years and just dressed it up for game day by taping on some football field scrapbook paper cut to size. Carefully remove the label from your water bottles and measure the size. 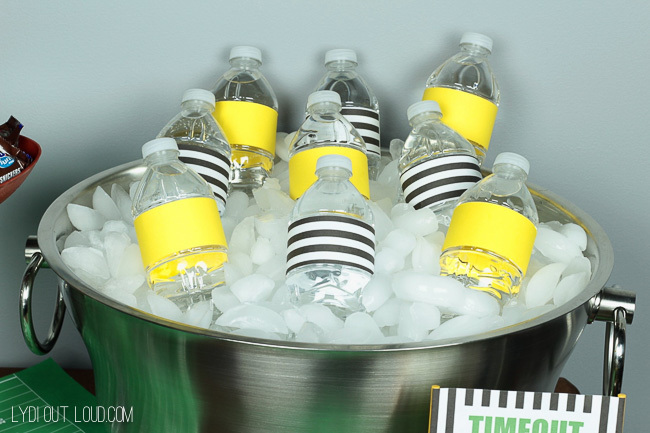 Measure and cut yellow and black/white paper to the size of the water bottle labels. Secure paper onto water bottles with a glue stick. 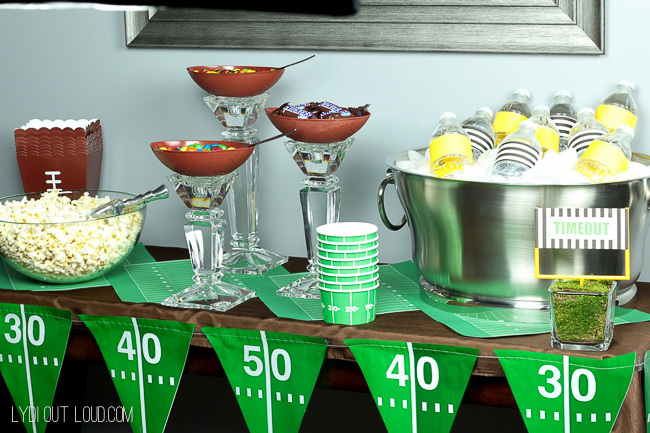 When the game is over and the party comes to a close, its time to congratulate the winners and send everyone off with some party favors! I set up a small table in our entryway with to-go goodie bags and water bottles for the guests to grab for the road when they leave. I filled the goodie bags with Peanut M&M’s Popcorn. Yummy!!! To make these, I simply folded football scrapbook paper over standard goodie bags and looped a white ribbon through. 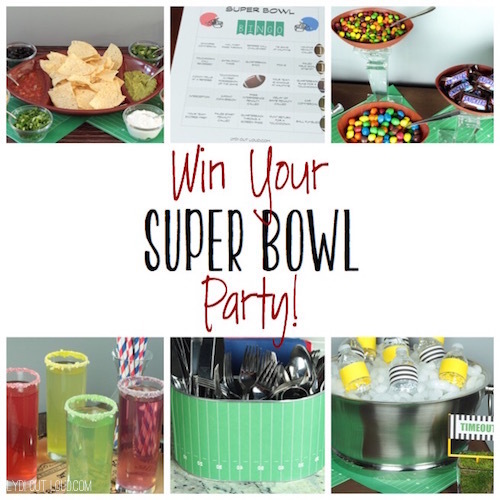 Do you have any Super Bowl party plans? Who is your favorite team? Love the ideas. Drooling over the Snicers brownies! Wow!!! This is amazing! Thanks for the great ideas! Great post! Clever and festive decorations! Makes me want to throw a Super Bowl Party.